My family and I recently went on a cruise to the Caribbean. 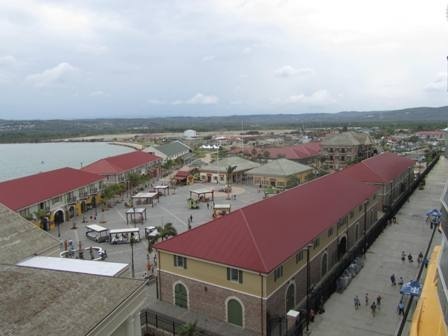 One of our stops was at Falmouth, Jamaica. What happened on that short visit had a profound impact on my life. The port at Falmouth viewed from our balcony. A group of us had planned to rent some four-wheelers and buzz around the area during our stop-over in Falmouth. After making some inquiries we discovered that we were not going to able to do that. So everyone ended up going their own way. A group of us decided to walk up and view an old fort. After walking for a while, we came to the conclusion that we had somehow missed the fort. As we discussed what to do, a young man (we later found out his name was “Dane”) came up and offered to help. He informed us that the fort was just back up the road and around the corner. We actually were not that far away from it. So, off we went. Dane walked along with us. 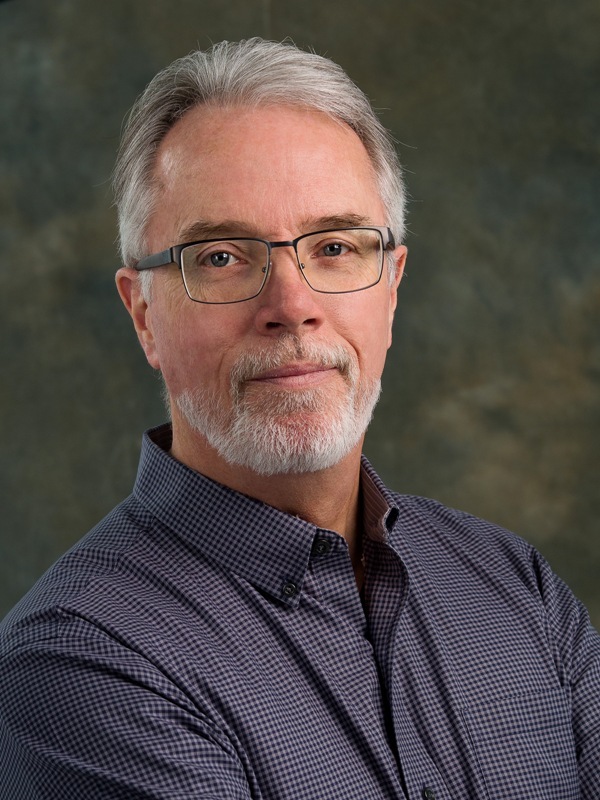 As we were walking along, we suddenly heard a group of people off to our left singing “Jesus Loves Me.” As we wondered who they were, Dane told us that the singing was coming from the infirmary and that we should go in there. 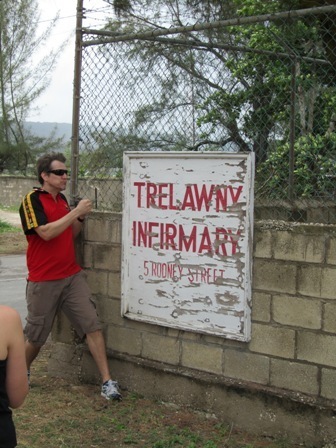 Long story short, Dane cleared the way and we all went into the Trelawny Infirmary. 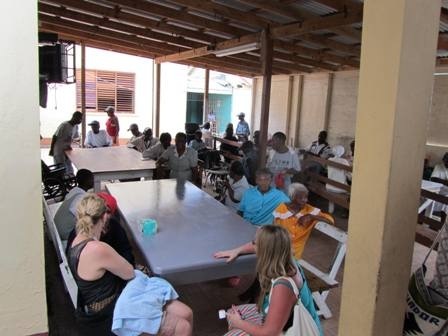 Once inside we discovered around forty people, most of them elderly, with all kinds of physical and mental disabilities. 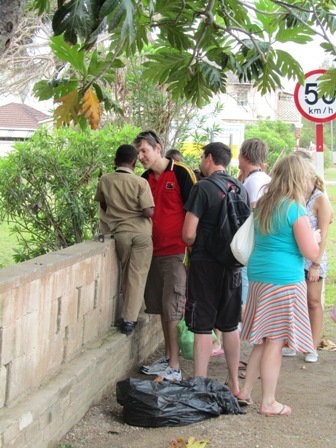 Our group spread out and began going around loving and blessing the people. The nurses there were absolutely thrilled. The people seemed to be really happy to have special visitors. It was quite the experience. We couldn’t stay long as the people were preparing to have their lunch. As we walked out the front gate, Pastor Duncan Smith of Raleigh, North Carolina, and my wife, Mina, began talking to Gerry the Security Guard. Gerry ended up giving his heart to the Lord! His face lit up like a light bulb. He even told one of the nurses that he now had Jesus in his heart. Our group was ecstatic! children playing in a field. Two of them were sitting across the road having their lunch. Pastor Smith began talking to them and led one of them to the Lord! That was two people coming to Christ in the space of less than an hour. Hallelujah! By this time, Dane (who had wandered off while we were in the infirmary) came walking down the road toward us. 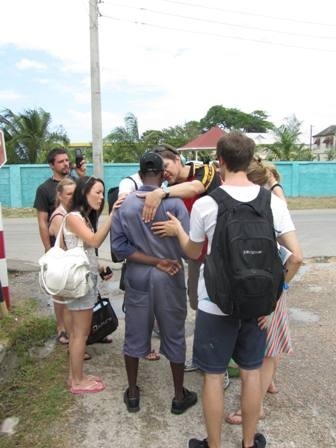 Duncan and some of the group began sharing with him, and he also surrendered to Jesus. Another man showed up with a need and some of our group immediately began praying with him. It was wild! This all took place right out on the street. Thank God the Holy Spirit is not limited to the inside of a building! Mina and our kids also ended up praying with some people. They were so grateful we had come and almost begged us to come back. It was all very moving. It was Kingdom come! 1. Love opens all doors. As we went to where the people in the infirmary were sitting, one of the young ladies in our group said, “I hope they let us in.” I looked at here and said, “Love opens all doors.” It is so true. When people know you genuinely care for them, they will open their homes and their hearts to you. 2. It doesn’t take much to make a miracle. All it really takes is loving the people. An arm around the shoulder, a kind word, even a simple smile, can lift a person’s spirits and give them hope. Just knowing someone cares enough to reach out goes a very long way. Such simple acts can literally change the course of a person’s life. 3. The required equipment is already present. If you one have one heart, one mouth, and two hands (or even one! ), you have all you need to be a servant of the King. The little you know about Jesus is more than most people know. The simplest prayer you can pray is enough to bring others into contact with the resources of Heaven. The focus needs to be on what one has rather than what is perceived as lack. The Lord will make up the difference. Too many Christians are constantly running from one equipping conference to another. They spend so much time gathering equipment, they never get around to using what they already have. I am not pointing fingers because I have done the same thing. Not any more. I want to begin making a difference in my world today with the tools the Lord has given me. What I witnessed in Falmouth, Jamaica, touched a place deep in my heart. I hope I never forget what I saw there. I got a good look at what life is like when someone is really living in the reign. All photos are the sole property of Mac Dumcum, and are not to be used without permission. Thank you for sharing this – especially for coupling it with a challenge to DO – just GO – and let God make up the difference for my lack. I want to live like this too – to trust that Love opens all doors, to walk in faith wherever I am.